My travel power adapter has surge protection built into it thanks to a small cylindrical fuse. The fuse blew yesterday (in unspectacular fashion). This left me without a source of power for my happy laptop, which was nearly out of battery power as it was. So updates will have to wait for a couple of days, because while I have found and replaced said fuse (after nearly a day of looking in the sleepy town I’m in), I now need sleep. 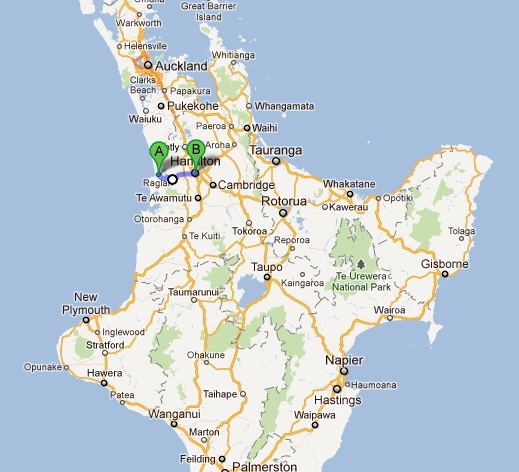 Lots of updating to come, including camping near Auckland, my first overnight hike…and jumping off waterfalls. Updates in a few days. New Zealand just wrapped up it’s national election on Saturday, with the National Party winning in commanding fashion. NZ is mostly a two party country, between the National Party, akin to Canada’s Conservatives, and the Labour Party, which would sit somewhere between NDP and Liberal in Canada. National had been the party in power going in – they increased their seats and now hold just under a majority, but with two of the minor parties a near certainty to support them, it’s pretty much a National majority. Sound similar to Canada? NZ has an interesting take on voting – they use MMP, or mixed member proportional. They are one of only two countries in the Western world to do so – Germany being the other. It is different in that you vote twice when you go – once for a representative from your riding, and once for a political party. It’s interesting, in it allows you to choose to vote for a local rep that you might like, but for a different national party if you so choose. All of the regi0nal representatives that win their ridings get a seat in parliament, and then there are a number of seats in parliament reserved for the party vote. Those party seats are divided based on the national percentage of party vote each party receives. This has an interesting effect, in that it results in both more minority governments being formed, and smaller, fringe groups often gaining seats and a voice. This election, National trounced Labour, and the Greens picked up quite a lot of party votes (13%), their best showing yet. A lot of this came down to the personalities of the leaders – National’s John Key (the Prime Minister) is a like-able, friendly guy who appears easy going and has a well-honed ‘every-man’ image. Labour’s leader, Phil Goff, came off as an aggressive car-salesman. His likability was in the tank, and Labour suffered for it. It amazes me when parties elect such unlikable people to be their leader…and are surprised when people don’t respond to them favourably. Having a blah/boring person is okay (I’d be hard pressed to differentiate between Harper and a robot at times), but being strongly disliked by many based on your personality (not even your ideas) really hurts. Charisma and good public speaking go a long way. The Green Party here was noted as having very likable main candidates and their big improvement in the polls is believed to be in response to that. It was interesting watching the campaigns – it really felt quite ‘amateur’ compared to what we see in Canada at times. Which was refreshing at times. The two debates I saw were a lot more debating and back and forth, even with amusing sayings such as Key saying Goff would ‘Spend like a drunken sailor’ if in power, and Goff constantly calling Key a liar based on prior promises. There was a 3rd debate open to all parties (including the smaller ones) which was good to see them get some spotlight. The fringe parties I talk about aren’t ‘fringe’ like they are in Canada (ie Communist Party of Canada). These are smaller, more focused parties, like the Maori party and the Greens which do hold more outside views, but are pretty reasonable all the same. 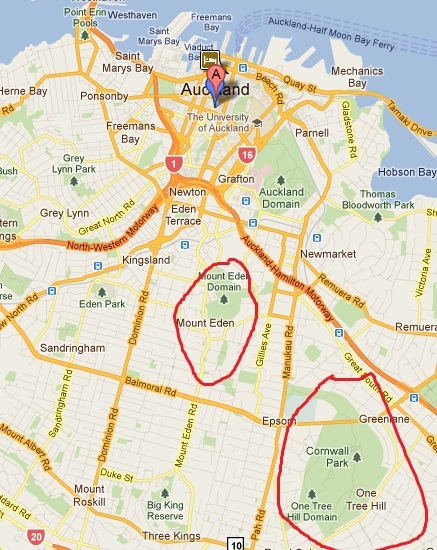 One thing I feel Auckland does well as a large city is keep large amounts of green space within the city. I explored two of them during my time in the city. The first was Mt. Eden. 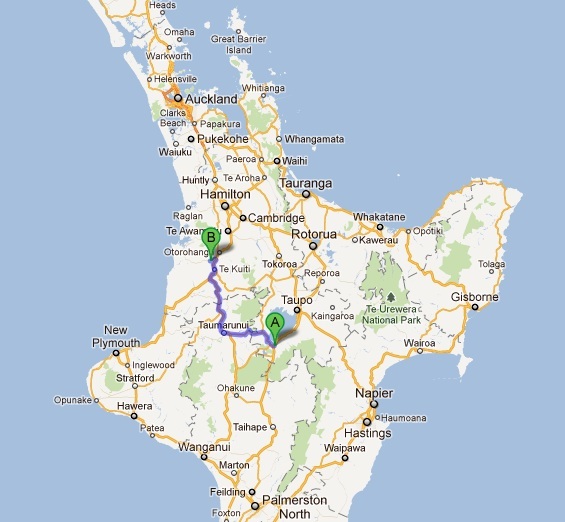 After finishing up my 3 nights in Raglan I was on the road again, but for much different pastures – next stop was Hamilton. 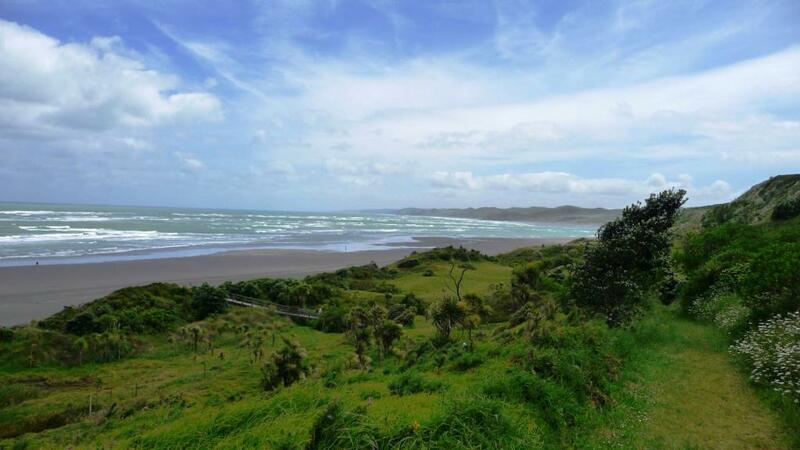 After spending an afternoon surfing, I had a day to myself to relax in Raglan. What better way than to explore and hike some of the highlights? First up was the Bridal Veil Falls. From the top, other than the height they weren’t overly special. It’s only when you move off to the side viewing platform that you really get a good view of them. 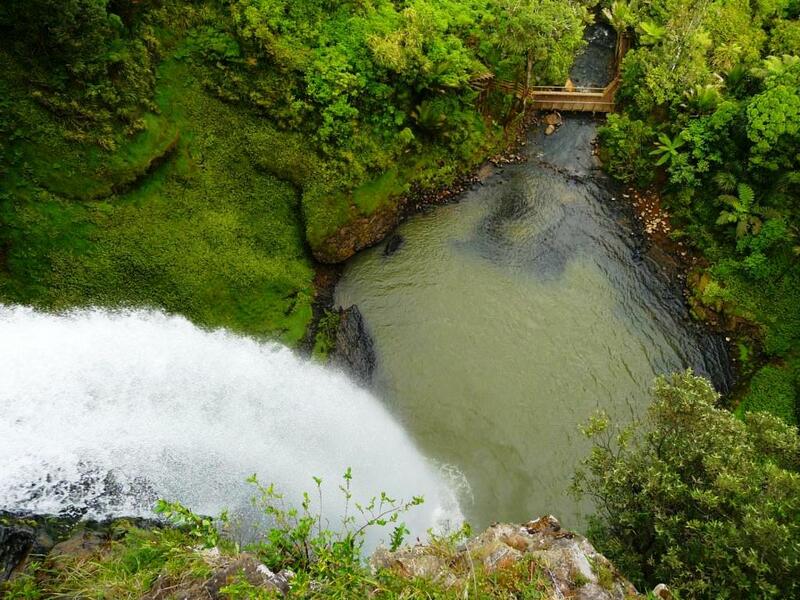 The water cascades over the cliffs and fall 55 meters into the pool below. Because I hadn’t spent enough hours the day prior in a cold, damp wetsuit, I opted to head to Raglan next. Raglan’s on the west coast of New Zealand’s north island. It is known for but one thing really. As New Zealand’s surfing mecca. Much like snowboarding, surfing was something that I’d always wanted to try. So here in Raglan I gave it a shot. The weather wasn’t great but the instructor was very good at keeping everyone moving. The waves were much larger than normal for beginners and the wind was howling, but we made the most of it. The Waitomo Caves are famed for their glow worms, a small maggot that creates a bio-luminescent secretion that gives off a bluish light. Many people come to the caves and take a walking or boat tour of some of these caves. That’s not for me, and numerous other adventure seekers however. For those that want a bit of adrenalin with their sightseeing, there are numerous other companies in Waitomo that cater to that kind of thing. The one I went with was the largest and most well established, a company called ‘The Legendary Blackwater Rafting Co.’ Blackwater rafting isn’t really related to whitewater rafting at all, other than it involves water. But more on that in a second. They had two different adventure options, a 3 hour ‘Black Labyrinth’ and the 5 hour ‘Black Abyss’. I chose the Abyss. After my 2 days in Turangi, specifically for the Tongariro Crossing, I once again packed up my things and headed off to a new destination – Waitomo.